AN IN-DEPTH LOOK AT MAXIMIZING YIELD, REDUCING RISK, AND INCREASING YOUR BOTTOM LINE HEADING INTO THE 2017 CROP YEAR. WE HAD AN AMAZING LINEUP OF LOCAL AND NATIONAL EXPERTS JOIN THE DISCUSSION, BRINGING THE BEST IN INSIGHT AND ADVICE TO OUR ATTENDEES. Report from the financial industry on agricultural balance sheet structure, working capital sources, workout programs, and regulator updates. Report from the real estate industry on land sales, trends, projections, and cash rent observations. The power of benchmarking your farm for maximum profitability and the purchasing power of farms as a collective group. Explanation of the variable rate technology available to producers and updates on the latest genetics available. Report of commodity and livestock price trends as well as forecasts for 2017 and beyond. Weather patterns, forecasts, and the ability to use this information to increase your farms profitability. Updates on insurance products and sharing information on the most common policy gaps. Succession and tax planning suggestions. Profit zone management. The ability to break your farm down to zones and evaluate each individually for profitability. The utilization of software and cloud base programs to monitor and increase a farms productivity and profitability. Explanation of marketing tools and vehicles for selling your grains and livestock. 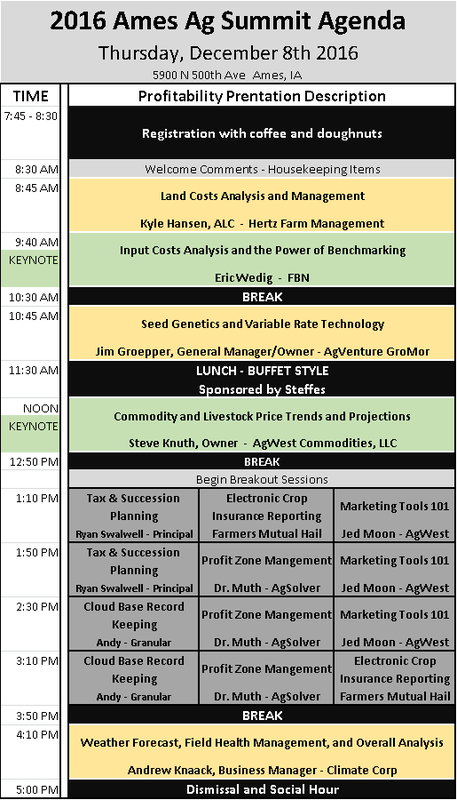 A local and independently organized annual meeting providing farms and operators of all sizes and experience levels access to the latest trends, projections, and the tools necessary to increase farming profitability. To provide Midwest farms and operators an annual, independent, and unbiased outlet for information related to increasing the profitability of their farming operation.